Last amendment: 2017, c. 20, Sched. 11, s. 8, 9. Legislative History: 1992, c. 32, s. 10; 1994, c. 27, s. 43 (2); 2006, c. 19, Sched. C, s. 1 (1); 2009, c. 33, Sched. 2, s. 31; 2017, c. 20, Sched. 11, s. 8, 9. Application of enactments as to probate, etc. Cases of children advanced by settlement, etc. “personal representative” means an executor, an administrator, or an administrator with the will annexed. (“représentant successoral”) R.S.O. 1990, c. E.22, s. 1; 2006, c. 19, Sched. C, s. 1 (1); 2009, c. 33, Sched. 2, ss. 31 (1, 2). 2 (1) All real and personal property that is vested in a person without a right in any other person to take by survivorship, on the person’s death, whether testate or intestate and despite any testamentary disposition, devolves to and becomes vested in his or her personal representative from time to time as trustee for the persons by law beneficially entitled thereto, and, subject to the payment of the person’s debts and so far as such property is not disposed of by deed, will, contract or other effectual disposition, it shall be administered, dealt with and distributed as if it were personal property not so disposed of. R.S.O. 1990, c. E.22, s. 2 (1). (2) This section applies to property over which a person executes by will a general power of appointment as if it were property vested in the person. R.S.O. 1990, c. E.22, s. 2 (2). (3) This section does not apply to estates tail or to the personal property, except chattels real, of a person who, at the time of death, is domiciled out of Ontario. R.S.O. 1990, c. E.22, s. 2 (3). 3 The enactments and rules of law relating to the effect of probate or letters of administration as respects personal property and as respects the dealing with personal property before probate or administration and as respects the payment of costs of administration and other matters in relation to the administration of personal estate and the powers, rights, duties and liabilities of personal representatives in respect of personal estate apply to real property vesting in them, so far as the same are applicable as if that real property were personal property, save that it is not lawful for some or one only of several joint personal representatives without the authority of a judge to sell or transfer real property. R.S.O. 1990, c. E.22, s. 3. 4 Subject to the other provisions of this Act, in the administration of the assets of a deceased person, his or her real property shall be administered in the same manner, subject to the same liability for debts, costs and expenses and with the same incidents as if it were personal property, but nothing in this section alters or affects as respects real or personal property of which the deceased has made a testamentary disposition the order in which real and personal assets are now applicable to the payment of funeral and testamentary expenses, the costs and expenses of administration, debts or legacies, or the liability of real property to be charged with the payment of legacies. R.S.O. 1990, c. E.22, s. 4. 5 Subject to section 32 of the Succession Law Reform Act, the real and personal property of a deceased person comprised in a residuary devise or bequest, except so far as a contrary intention appears from the person’s will or any codicil thereto, is applicable rateably, according to their respective values, to the payment of his or her debts, funeral and testamentary expenses and the cost and expenses of administration. R.S.O. 1990, c. E.22, s. 5. 6 When any part of the real property of a deceased person vests in his or her personal representative under this Act, such personal representative, in the interpretation of any Act of the Legislature or in the construction of any instrument to which the deceased was a party or under which the deceased is interested, shall, while the estate remains in the personal representative, be deemed in law the deceased’s persons heir, in respect of such part, unless a contrary intention appears, but nothing in this section affects the beneficial right to any property or the construction of words of limitation of any estate in or by any deed, will or other instrument. R.S.O. 1990, c. E.22, s. 6. 7 Where an estate or interest of inheritance in real property is vested on a trust or by way of mortgage in a person solely, it, on his or her death, despite any testamentary disposition, devolves to and becomes vested in the person’s executor or administrator in like manner as if it were personal estate vesting in him or her, and accordingly all the like powers for one only of several joint executors or administrators as well as for a single executor or administrator and for all the executors and administrators together to dispose of and otherwise deal with it belong to the deceased’s executor or administrator with all the like incidents but subject to all the like rights, equities and obligations as if it were personal estate vesting in him or her, and for the purposes of this section the executor or administrator of the deceased shall be deemed in law his or her heirs and assigns within the meaning of all trusts and powers. R.S.O. 1990, c. E.22, s. 7. 8 (1) Where there is no legal personal representative of a deceased mortgagor of freehold property, it is sufficient for the purposes of an action for the foreclosure of the equity of redemption in, or for the sale of such property that the person beneficially entitled under the last will and testament, if any, of the deceased mortgagor, or under Part II of the Succession Law Reform Act, to such property or the proceeds thereof be made defendant to such action, and it is not necessary that a legal personal representative of the deceased mortgagor be appointed or be made a defendant thereto unless it is otherwise ordered by the court in which the action is brought, but, if during the pendency of such action, the equity of redemption devolves upon and becomes vested in a legal personal representative of the mortgagor, the legal personal representative shall be made a party to the action. R.S.O. 1990, c. E.22, s. 8 (1). “mortgagor” includes the assignee of a mortgagor and any person entitled to or interested in the equity of redemption. R.S.O. 1990, c. E.22, s. 8 (2). 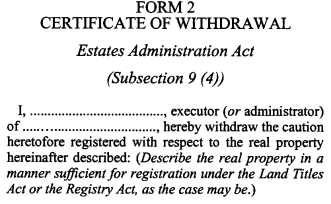 9 (1) Real property not disposed of, conveyed to, divided or distributed among the persons beneficially entitled thereto under section 17 by the personal representative within three years after the death of the deceased is, subject to the Land Titles Act in the case of land registered under that Act and subject to subsections 53 (3) and (5) of the Registry Act, and subject as hereinafter provided, at the expiration of that period, whether probate or letters of administration have or have not been taken, thenceforth vested in the persons beneficially entitled thereto under the will or upon the intestacy or their assigns without any conveyance by the personal representative, unless such personal representative, if any, has signed and registered, in the proper land registry office, a caution in Form 1, and, if a caution is so registered, the real property mentioned therein does not so vest for three years from the time of the registration of the caution or of the last caution if more than one was registered. R.S.O. 1990, c. E.22, s. 9 (1). (2) The execution of every caution shall be verified by the affidavit of a subscribing witness in the manner prescribed by the Registry Act or the Land Titles Act, as the case may be. R.S.O. 1990, c. E.22, s. 9 (2). (3) A caution registered or reregistered under this section or under section 11 is effectual only as to the real property mentioned in the caution. R.S.O. 1990, c. E.22, s. 9 (3). (4) The personal representative, before the expiration of the three years, may register a certificate in Form 2 withdrawing the caution in respect of the real property described in the certificate, and, upon registration of the certificate, the real property described therein shall be treated as if the caution had expired. R.S.O. 1990, c. E.22, s. 9 (4). 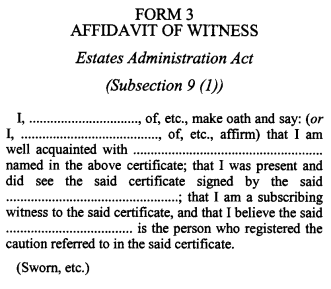 (5) The certificate of withdrawal shall be verified by an affidavit of a subscribing witness in Form 3. R.S.O. 1990, c. E.22, s. 9 (5). (6) Before a caution expires it may be reregistered and so on from time to time as long as the personal representative considers it necessary, and every caution continues in force for three years from the time of its registration or reregistration. R.S.O. 1990, c. E.22, s. 9 (6). (7) The Minister responsible for the administration of this Act may make regulations prescribing forms for the purposes of this section and providing for their use. 2017, c. 20, Sched. 11, s. 8 (4). 10 Nothing in section 9 derogates from any right possessed by an executor or administrator with the will annexed under a will or under the Trustee Act or from any right possessed by a trustee under a will. R.S.O. 1990, c. E.22, s. 10. (d) in the absence and in lieu of such consent, an order of the court, or the certificate of the Children’s Lawyer or of the Public Guardian and Trustee, as the case may be, authorizing the caution to be registered or reregistered, which order or certificate the judge, the Children’s Lawyer or the Public Guardian and Trustee may make with or without notice on such evidence as satisfies him or her of the propriety of permitting the caution to be registered or reregistered, and the order or certificate to be registered does not require verification and shall not be rendered null by any defect of form or otherwise. R.S.O. 1990, c. E.22, s. 11 (1); 1994, c. 27, s. 43 (2); 2009, c. 33, Sched. 2, ss. 31 (3-5). (2) This section extends to cases where a grant of probate of the will or of administration to the estate of the deceased may not have been made within the period after the death of the testator or intestate within which a caution is required to be registered. R.S.O. 1990, c. E.22, s. 11 (2). 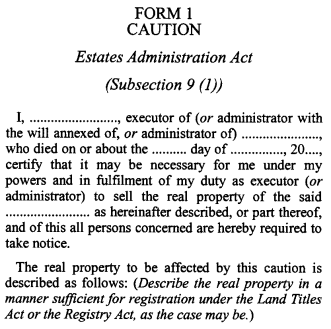 (3) Where a caution is registered or reregistered under this section, it has the same effect as a caution registered within the proper time after the death of the deceased and of vesting or revesting, as the case may be, the real property of the deceased in his or her personal representative, save as to persons who in the meantime have acquired rights for valuable consideration from or through a person beneficially entitled, and save also and subject to any equities of any non-consenting person beneficially entitled, or of a person claiming under the person beneficially entitled, for improvements made after the time within which the personal representative might, without any consent, order or certificate, have registered or reregistered a caution, if his or her real property is afterwards sold by the personal representative. R.S.O. 1990, c. E.22, s. 11 (3). (4) Where there are two or more personal representatives, it is sufficient if a caution or the affidavit mentioned in clause (1) (b) is signed or made by one of such personal representatives. R.S.O. 1990, c. E.22, s. 11 (4). 12 Where a caution has been registered or reregistered under any enactment repealed and not re-enacted by this Act and is still in force, such caution has the same effect as if such enactment had not been repealed and may be registered in the manner provided by section 9. R.S.O. 1990, c. E.22, s. 12. 13 Any person beneficially entitled to any real property affected by the registration or reregistration of a caution may apply to a judge to vacate the registration or reregistration, and the judge, if satisfied that the vesting of any such real property in such person or of any property of the deceased in any other of the persons beneficially entitled ought not to be delayed, may order that the registration or reregistration be vacated as to such property, and every caution, the registration or reregistration of which is so vacated, thereafter ceases to operate. R.S.O. 1990, c. E.22, s. 13. 14 Where real property becomes vested under this Act in two or more persons beneficially entitled under this Act, they take as tenants in common in proportion to their respective rights, unless in the case of a devise they take otherwise under the will of the deceased. R.S.O. 1990, c. E.22, s. 14. 15 (1) Where a minor is interested in real property that but for this Act would not devolve on the personal representative, no sale or conveyance is valid under this Act without the written approval of the Children’s Lawyer, or, in the absence of such consent or approval, without an order of a judge. R.S.O. 1990, c. E.22, s. 15 (1); 1994, c. 27, s. 43 (2). (2) A judge may appoint himself or herself or another judge as local guardian of minors in a county or district during the pleasure of the judge, with authority to give such written approval instead of the Children’s Lawyer, and the Children’s Lawyer and local guardian are subject to such rules as the court may make in regard to their authority and duties under this Act. R.S.O. 1990, c. E.22, s. 15 (2); 1994, c. 27, s. 43 (2). 16 Except as otherwise provided in this Act, the personal representative of a deceased person has power to dispose of and otherwise deal with the real property vested in the personal representative by virtue of this Act, with the like incidents, but subject to the like rights, equities and obligations, as if the real property were personal property vested in the personal representative. R.S.O. 1990, c. E.22, s. 16. 17 (1) The powers of sale conferred by this Act on a personal representative may be exercised for the purpose not only of paying debts but also of distributing or dividing the estate among the persons beneficially entitled thereto, whether there are or are not debts, and in no case is it necessary that the persons beneficially entitled concur in any such sale except where it is made for the purpose of distribution only. R.S.O. 1990, c. E.22, s. 17 (1). (2) Except with the approval of the majority of the persons beneficially entitled thereto representing together not less than one-half of all the interests therein, including the Children’s Lawyer acting on behalf of a minor or the Public Guardian and Trustee acting on behalf of a mentally incapable person who has no guardian or attorney for property, no sale of any such real property made for the purpose of distribution only is valid as respects any person beneficially entitled thereto unless the person concurs therein, but, where a minor or a mentally incapable person who has no guardian or attorney for property is beneficially entitled or where there are other persons beneficially entitled whose consent to the sale is not obtained by reason of their place of residence being unknown or where in the opinion of the Children’s Lawyer or the Public Guardian and Trustee, as the case may be, it would be inconvenient to require the concurrence of such persons, the Children’s Lawyer or the Public Guardian and Trustee may, upon proof satisfactory to him or her that the sale is in the interest and to the advantage of the estate of the deceased person and the persons beneficially interested therein, approve the sale on behalf of such minor or mentally incapable person and non-concurring persons, and any such sale made with the written approval of the Children’s Lawyer on behalf of such minor or the Public Guardian and Trustee on behalf of such mentally incapable person is valid and binding upon the minor or mentally incapable person and non-concurring persons, and for this purpose the Children’s Lawyer has the same powers and duties as he or she has in the case of minors and the Public Guardian and Trustee has the same powers and duties as he or she has in the case of mentally incapable persons, but in any case a judge may dispense with the concurrence of the persons beneficially entitled or any or either of them. R.S.O. 1990, c. E.22, s. 17 (2); 1994, c. 27, s. 43 (2); 2009, c. 33, Sched. 2, s. 31 (6). (3) The personal representative has power, with the concurrence of the adult persons beneficially entitled thereto, and with the written approval of the Children’s Lawyer on behalf of minors or of the Public Guardian and Trustee on behalf of mentally incapable persons who have no guardian or attorney for property, if any, so entitled, to convey, divide or distribute the estate of the deceased person or any part thereof among the persons beneficially entitled thereto according to their respective shares and interests therein. R.S.O. 1990, c. E.22, s. 17 (3); 1994, c. 27, s. 43 (2); 2009, c. 33, Sched. 2, s. 31 (7). (4) Where a person beneficially entitled is a patient in a psychiatric facility under the Mental Health Act and the Public Guardian and Trustee is his or her guardian of property, the Public Guardian and Trustee may give the concurrence and approval required by subsections (2) and (3). 1992, c. 32, s. 10. (5) Upon the application of the personal representative or of any person beneficially entitled, the court may, before the expiration of three years from the death of the deceased, direct the personal representative to divide or distribute the estate or any part thereof to or among the persons beneficially entitled according to their respective rights and interests therein. R.S.O. 1990, c. E.22, s. 17 (5). (6) The power of division conferred by subsection (3) may also be exercised, although all the persons beneficially interested do not concur, with the written approval of the Children’s Lawyer or of the Public Guardian and Trustee, as the case may be, which may be given under the same conditions and with the like effect as in the case of a sale under subsection (2). R.S.O. 1990, c. E.22, s. 17 (6); 1994, c. 27, s. 43 (2); 2009, c. 33, Sched. 2, s. 31 (8). (7) Section 16 and this section do not apply to an administrator where the letters of administration are limited to the personal property, exclusive of the real property, and do not derogate from any right possessed by a personal representative independent of this Act, but an executor shall not exercise the powers conferred by this section until the executor has obtained probate of the will except with the approval of a judge. R.S.O. 1990, c. E.22, s. 17 (7). (c) upon the expiration of such three-year period where no certificate of pending action or caution has been registered, subsection 21 (2) and section 23 apply as if such real property had become vested in the person beneficially entitled thereto under section 9. R.S.O. 1990, c. E.22, s. 17 (8). 18 The acceptance by an adult of his or her share of the purchase money in the case of a sale by a personal representative that has been made without the written approval of the Children’s Lawyer or of the Public Guardian and Trustee, where such approval is required, is a confirmation of the sale as to him or her. R.S.O. 1990, c. E.22, s. 18; 1994, c. 27, s. 43 (2); 2009, c. 33, Sched. 2, s. 31 (9). 19 A person purchasing in good faith and for value real property from a personal representative in a manner authorized by this Act is entitled to hold it freed and discharged from any debts or liabilities of the deceased owner, except such as are specifically charged thereon otherwise than by his or her will, and from all claims of the persons beneficially entitled thereto, and is not bound to see to the application of the purchase money. R.S.O. 1990, c. E.22, s. 19. 20 Repealed: 2009, c. 33, Sched. 2, s. 31 (10). 21 (1) A person purchasing real property in good faith and for value from a person beneficially entitled, to whom it has been conveyed by the personal representative, by leave of a judge, is entitled to hold it freed and discharged from any debts and liabilities of the deceased owner, except such as are specifically charged thereon otherwise than by his or her will, but nothing in this section affects the rights of creditors as against the personal representative personally, or as against any person beneficially entitled to whom real property of a deceased owner has been conveyed by the personal representative. R.S.O. 1990, c. E.22, s. 21 (1). (2) Real property that becomes vested in a person beneficially entitled thereto under section 9 continues to be liable to answer the debts of the deceased owner so long as it remains vested in such person, or in any person claiming under that person, not being a purchaser in good faith and for valuable consideration, as it would have been if it had remained vested in the personal representative, and in the event of a sale thereof in good faith and for value by such person beneficially entitled that person is personally liable for such debts to the extent of the proceeds of such real property. R.S.O. 1990, c. E.22, s. 21 (2). (c) power to mortgage for the payment of debts. R.S.O. 1990, c. E.22, s. 22 (1); 1994, c. 27, s. 43 (2); 2009, c. 33, Sched. 2, s. 31 (11). (2) The written approval of the Children’s Lawyer or of the Public Guardian and Trustee to mortgaging is required where it would be required if the real property were being sold. R.S.O. 1990, c. E.22, s. 22 (2); 1994, c. 27, s. 43 (2); 2009, c. 33, Sched. 2, s. 31 (12). 23 (1) A purchaser in good faith and for value of real property of a deceased owner that has become vested under section 9 in a person beneficially entitled thereto is entitled to hold it freed and discharged from the claims of creditors of the deceased owner except such of them of which the purchaser had notice at the time of the purchase. R.S.O. 1990, c. E.22, s. 23 (1). (2) Nothing in subsection (1) affects the right of the creditor against the personal representative personally where the personal representative has permitted the real property to become vested in the person beneficially entitled to the prejudice of the creditor or against the person beneficially entitled. R.S.O. 1990, c. E.22, s. 23 (2). 24 (1) A personal representative shall make reasonable inquiries for persons who may be entitled by virtue of a relationship traced through a birth outside marriage. R.S.O. 1990, c. E.22, s. 24 (1). (b) the personal representative makes such search of the records of the Registrar General relating to parentage as is available for the existence of persons who are entitled by virtue of a relationship traced through a birth outside marriage and the search fails to disclose the existence of such a person. R.S.O. 1990, c. E.22, s. 24 (2). (3) Nothing in the section prejudices the right of any person to follow the property, or any property representing it, into the hands of any person other than a purchaser in good faith and for value, except that where there is no presumption or court finding of the parentage of a person born outside marriage until after the death of the deceased, a person entitled by virtue of a relationship traced through the birth is entitled to follow only property that is distributed after the personal representative has actual notice of an application to establish the parentage or of the facts giving rise to a presumption of parentage. R.S.O. 1990, c. E.22, s. 24 (3). 25 (1) If a child of an intestate has been advanced by the intestate by settlement or portion of real or personal property or both, and the same has been so expressed by the intestate in writing or so acknowledged in writing by the child, the value thereof shall be reckoned, for the purposes of this section only, as part of the real and personal property of the intestate to be distributed under this Act, and if the advancement is equal to or greater than the amount of the share that the child would be entitled to receive of the real and personal property of the intestate, as so reckoned, then the child and his or her descendants shall be excluded from any share in the real and personal property of the intestate. R.S.O. 1990, c. E.22, s. 25 (1). (2) If the advancement is less than the share, the child and his or her descendants are entitled to so much only of the real and personal property as is sufficient to make all the shares of the children in the real and personal property and advancement to be equal, as nearly as can be estimated. R.S.O. 1990, c. E.22, s. 25 (2). (3) The value of any real or personal property so advanced shall be deemed to be that, if any, which has been acknowledged by the child by an instrument in writing, otherwise the value shall be estimated according to the value of the property when given. R.S.O. 1990, c. E.22, s. 25 (3). (4) The maintaining or educating of, or the giving of money to, a child without a view to a portion or settlement in life shall not be deemed an advancement within the meaning of this Act. R.S.O. 1990, c. E.22, s. 25 (4). 26 Subject to section 53 of the Trustee Act, no distribution shall be made on an intestacy until after one year from the death of the intestate, and every person to whom in distribution a share is allotted shall, if any debt owing by the intestate is afterwards sued for and recovered or otherwise duly made to appear, refund and pay back to the personal representative the person’s rateable part of that debt and of the costs of suit and charges of the personal representative by reason of such debt out of the part or share so allotted to the person, thereby to enable the personal representative to pay and satisfy such debt, and shall give bond with sufficient sureties that the person will do so. R.S.O. 1990, c. E.22, s. 26. 27 The Lieutenant Governor in Council may appoint a temporary deputy of the Children’s Lawyer for the purposes of this Act who shall have all the powers of the Children’s Lawyer for such purposes. R.S.O. 1990, c. E.22, s. 27; 1994, c. 27, s. 43 (2). 28 Affidavits may be used in proceedings taken under this Act. R.S.O. 1990, c. E.22, s. 28. R.S.O. 1990, c. E.22, Form 1. R.S.O. 1990, c. E.22, Form 2. R.S.O. 1990, c. E.22, Form 3.